In January 2018, I was interviewed by a British journalist for an article he was writing about the PyeongChang 2018 Winter Olympics and South Korea’s dog meat trade. Unfortunately, the article was not published so we are sharing the interviewer’s questions and my responses here. What made you become involved in the issue? I love dogs. I had several dogs in my life so I know how wonderful they are. Currently I have 2 rescued dogs. Back in the summer of 2011, I was home searching the internet to find dog rescue groups to support, and came across information about a campaign against South Korea’s dog meat trade. As someone who grew up in Korea, I knew about the dog eating but I didn’t know that there were groups campaigning against it. As I started learning about the dog meat industry, I saw photos and videos that I have never seen before. All those images were like a nightmare and I was completely heartbroken. I felt desperate to save these dogs from such a horrible treatment. I knew nothing about campaigning nor activism but I had to do something to stop this terrible injustice. So I started doing whatever I could to help them, including translating and sharing news, stories, photos, and videos on social media. I continued on to create my own website, petitions, campaigns, etc. At first I was very naïve to think that if I worked really hard day and night at this I could end the Korea’s dog meat trade in one year. I definitely underestimated the magnitude of this industry and how difficult it is to change a country. Since then I have not been able to stop campaigning because I can not stop thinking about these dogs. In winter, I worry that they’ll be so cold and many of them will freeze to death, and in the summer I worry that the dogs will all be brutally killed because summer is a busy dog eating season in Korea. There isn’t a day when I don’t think about these dogs. Will visitors to Korea or competitors to the games come into contact with elements of the dog meat trade – if so what will they see? It is likely that the visitors or competitors to the games will see dog meat restaurants, as these restaurants are located throughout the country. A search for “Dog Meat Soup” resulted in 4,718 restaurants ( https://map.naver.com/index.nhn?query=67O07Iug7YOV&enc=b64&tab=1). This doesn’t include so called “Health Food Shops” that commonly sell “Dog Soju”, meaning “Dog Elixir”, which is made from the carcass of a dog. However, since these restaurants don’t usually have English signs, people will not know it even if they pass by them. Dog meat vendors/shops are usually located in or near the open air markets. Moran Market in Seongnam, Gupo Market in Busan and Chilseong Market in Daegu are some of these. You can find more information about the Moran Market in Seongnam, the largest dog meat market in Korea, and its move to hide the slaughter houses here: http://koreandogs.org/no-display-slaughter-dogs-notorious-seongnam-moran-market/ One dog meat vendor at Moran Market refuses to keep their agreement to remove the cages and slaughter facility and is still slaughtering dogs at their shop. Large scale dog farms/slaughterhouses are usually located in more remote places such as in rural areas or in the hill or mountainous areas. Many of them are hidden behind walls and fences, some with heavy security systems. Therefore, it is less likely that the visitors will come in contact with these places. Visitors venturing out to the neighborhoods or to the countryside might see small backyard breeders breeding dogs to eat or to sell at the market for meat. Is there a risk visitors will be served dog meat without realising what they are eating? There is no risk that the visitors will be served dog meat without realizing what they are eating. That’s because dog meat is more expensive than other meat so no restaurant will serve dog meat as something else. Are there regions in the country where the practice is more widespread than others? In South Korea, the dog meat trade is widespread all around the country. In June of last year, KARA (Korea Animal Rights Advocates) published the result of their survey on the dog for meat farm distribution by region: http://koreandogs.org/kara-press-conference/ Based on their survey, Gyeonggi-do has the most dog farms but that’s because they have the largest population. I would like to note that these figures by KARA are low estimates and no one knows for sure how many dog farms and slaughterhouses exist in Korea. Is there legislation to protect dogs? What is it? South Korea has enacted the Animal Protection Act (APA) which is supposed to protect these dogs from cruelty. However, these protections are currently being applied only to companion dogs and not to the dogs in the meat industry. Article 8 of the APA prohibits cruelty to animals and killing them using cruel methods ( http://koreandogs.org/info/korean-animal-rights-law/apa-full-text-aug2011/). However, these laws are rarely enforced for the dogs in the meat industry and perpetrators very rarely get punished for violating them. A good example is this recent case: ( http://www.fnnews.com/news/201712230952598289, https://ekara.org/activity/against/read/9149). In September of last year, the Seoul High Court affirmed the Incheon District Court’s ruling that electrocution as a dog slaughter method is not cruel and therefore the perpetrator was not guilty of animal cruelty. This is despite the fact that electrocution causes severe pain and stress on dogs ( http://koreandogs.org/humane-slaughtering-dogs-human-consumption-possible/). Several animal rights groups in Korea including KARA have filed an appeal to the Supreme court and currently the case is being reviewed. However, the majority of Koreans show a profound indifference to both the law and any moral principles by doing nothing at all to stop the dog-meat trade; dogs are being brutally tortured and eaten as if it were completely legal. The Nation of Samsung, Hyundai, Kia, LG and other global high tech brands is a failure when it comes to animal protection. In your opinion, how serious is the government in its desire to stop the practice? The Korean government seems to be clueless as to why we are asking them to stop eating dogs. They don’t seem to be in any hurry to bring an end to the dog and cat meat trade. When President Moon Jae-In took office in May of last year, we were hopeful that he would finally bring an end this horrible cruelty because he made campaign promises that he would improve the welfare of animals ( http://koreandogs.org/moon/). However, we have yet to hear anything from the President about this issue. The only politician who has announced plans to end the dog meat trade is Congressman Pyo Changwon (http://koreandogs.org/pyo-changwon-fb/). But this issue cannot be resolved without the effort of the President and the majority of the government officials in power. 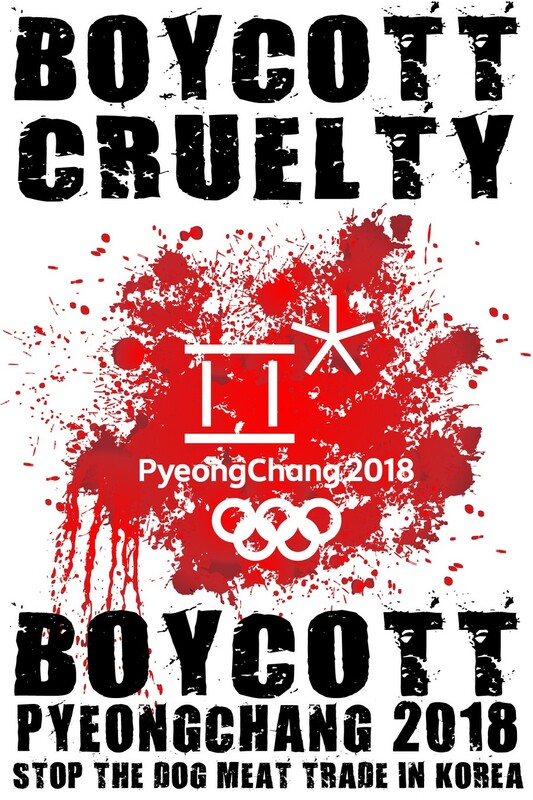 We have been campaigning, asking people to boycott PyeongChang 2018 as well as urging hundreds of Sister/Friendship cities of Korean cities around the world to speak out against the cruel trade of their Korean counterparts. However, only one city in Korea has responded to our campaign and decided to move towards becoming “dog meat free”. That was Mayor Kim Man-Soo of Bucheon ( http://koreandogs.org/bucheon-mayor-kim/ http://koreandogs.org/monumental-changes-happening-bucheon-become-first-dog-meat-free-city-south-korea/). All the other cities either ignored us, responded with typical excuses or denied that this industry operates in their cities. Therefore, we still don’t see the light at the end of the tunnel and this has been a very difficult and heart wrenching wait for us. What measures have been introduced ahead of the Games to clean up the image of the trade? Will the initiative to change restaurant signage stop meat being sold, or is it just a temporary measure? http://koreandogs.org/pc2018-sign-project/. However, according to Hankookilbo, due to the outcry from animal advocates, they have revised their plans to instead subsidize 20,000,000 won to each dog meat restaurant that changes its business. It reported that it’s been a year since this plan rolled out and so far only 2 restaurants have accepted the offer. ( http://www.hankookilbo.com/v/9b93dcf57a1741829a07a65d40324b53) I am not aware of any other measures that the Korean government is taking to hide or clean up the image of the trade. I think they realize that any effort to hide the dog meat industry from the world will only be a futile attempt because of the internet and social media. What is public opinion in Korea of the trade? Nowadays, more and more people in Korea are trying to protect animals through volunteering and joining the campaign against eating dogs. However, the majority of Koreans are still profoundly indifferent to the immense suffering of and cruelty against these dogs. They became immune to the cruelty because they grew up thinking that the dogs they eat are different than the dogs they keep as pets. Generally the younger generations are against eating dogs and they don’t participate in it. However, the problem is that even though they might be against eating dogs, they will do nothing to stop it. They don’t want to tell others what to do or not to do. And since citizens are not demanding change, their government doesn’t have a reason to change. South Korean society has achieved rapid economic development but they have neglected ethical development and animal abuse is symptomatic of that neglect. What measures are being taken by activists during the games to highlight the issue, such as petitions and protests? 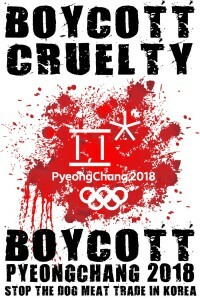 We have also petitioned the corporate sponsors of the PyeongChang 2018 to withdraw their sponsorship https://www.change.org/p/to-the-sponsors-of-pyeongchang-2018-winter-olympics-in-south-korea-please-help-bring-an-end-to-the-dog-and-cat-meat-trades-in-south-korea.